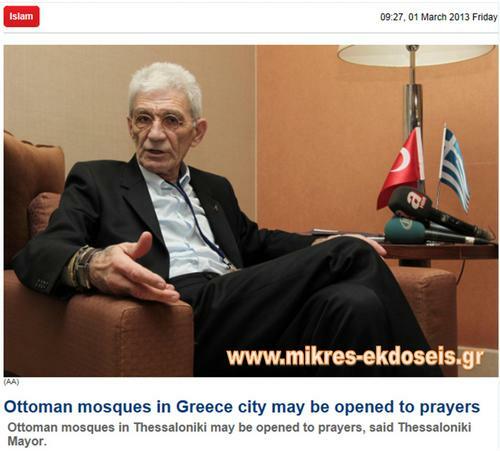 Mayor of Thessaloniki, Yiannis Boutaris on Thursday said that Ottoman mosques in Thessaloniki may be opened to prayers. Speaking to reporters in Ankara as part of the Turkish-Greek Tourism Forum, Mayor Boutaris indicated that it was up to the Greek government to open mosques to prayers. "I consider myself a brother of the Turks. I consider myself a partner with the Europeans," Boutaris also said. Mayor Boutaris commenced his speech by describing Thessaloniki and indicating the current restoration process of the city’s famous Freedom Square in which the Young Turks began to revolt, and the repair of the house in which Ottoman Sultan II. Abdul Hamid resided during his exile. Boutaris was asked to assess the debates about the construction of a mosque in Athens and the restoration of Ottoman monuments in Thessaloniki. Αναρτήθηκε από mikres-ekdoseis στις 3:41 μ.μ.